The Faculty of Education (FEd) of the University of the Philippines Open University (UPOU) held its Recognition Rites and Fellowship Program last 28 September 2018 at Mer-Nel’s Place, Los Baños, Laguna. For the Academic Year 2017-2018, FEd produced 111 graduates from its undergraduate, post-baccalaureate diploma and certificate, and graduate programs. Currently, the FEd is offering two undergraduate programs, the Associate in Arts and Bachelor of Education Studies, four post-baccalaureate diploma programs namely Diploma in Mathematics Teaching, Diploma in Science Teaching, Diploma in Language and Literacy Education and Diploma in Social Studies Education, and one post-baccalaureate certificate program, the Graduate Certificate in Distance Education. FEd also has the following graduate programs: Master of Distance Education, Master of Arts in Language and Literacy Education, Master of Arts in Social Studies Education, and Doctor of Philosophy (PhD) in Education, with majors in Biology Education, Chemistry Education, Mathematics Education, and Physics Education. In this year’s commencement exercises, the Faculty recognized the three graduates from the PhD in Education (Major in Physics Education) program. The graduates, Ms. Fely Buera, Mr. Billy Danday and Ms. Rachel Remedios, were the first students to complete this area of specialization since it was first offered in 1996. Dr. Gabino Petilos, a PhD in Education (Major in Mathematics Education) alumnus, was invited to give an inspirational talk to the graduates. According to Dr. Petilos, the key to finishing his doctorate degree was sticking to routines. During his time as a UPOU graduate student, he made sure that assignments were done two weeks before the deadline, so that he would be able to submit them on time. 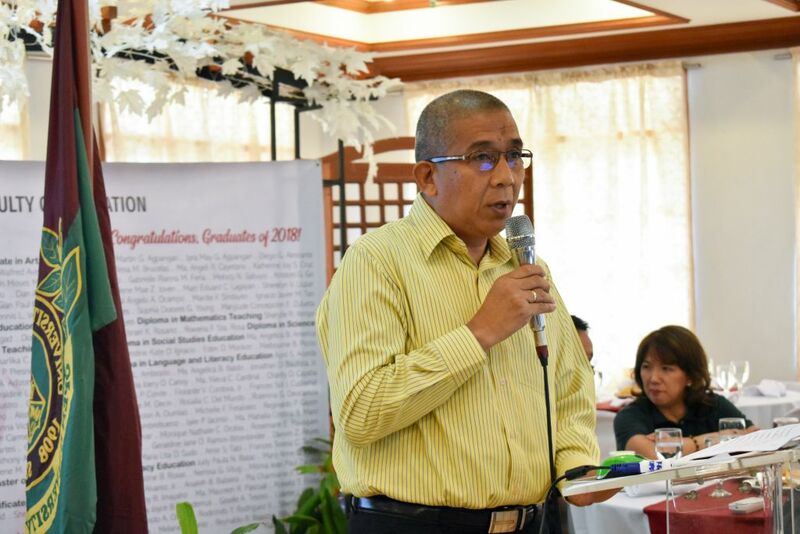 PhD in Education (Major in Mathematics Education) alumnus Gabino P. Petilos shares his post-graduate experiences and observations to the A.Y. 2017–2018 UPOU FEd graduates. 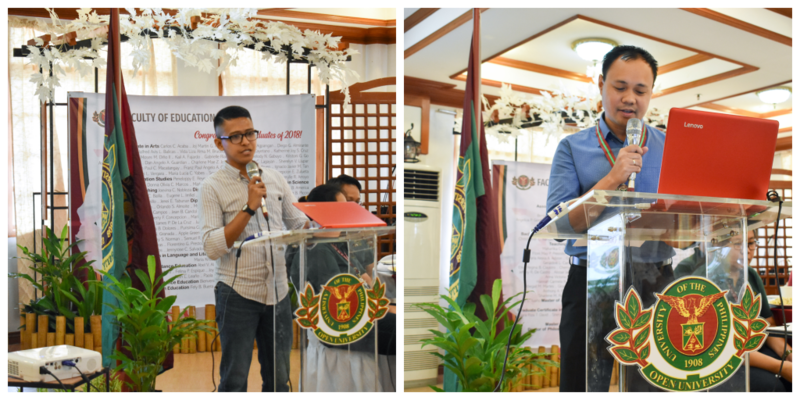 On the other hand, Mr. Dennis Vergara from the Associate in Arts program and Mr. Billy Danday, a Dean’s Lister from the PhD in Education program, represented their fellow graduates and delivered their response messages. Mr. Vergara shared that his journey to wearing the Sablay was as important as finishing his degree. Above all, he mentioned that maintaining integrity in everything he did allowed him to succeed in his endeavors as a UPOU student. Meanwhile, Mr. Danday revealed that being a UPOU graduate student taught him humility and generosity. As a teacher himself, UPOU helped him further understand his students and accept their limitations. He was also encouraged to be generous in sharing his knowledge to them, a value that he learned from his professors in the University. Associate in Arts graduate Dennis L. Vergara (left) and PhD in Education (Major in Physics Education) graduate Billy A. Danday (right) recount their journeys and lessons learned as UPOU students. After the Recognition Rites and Fellowship Program, the A.Y. 2017–2018 graduates were joined by other FEd alumni and alumnae during the Alumni Association Organizational Meeting, also held at Mer-Nel’s Place, Los Baños, Laguna.